Liquor Liability | Nashville Personal Injury Lawyers The Law Offices of John Day, P.C. At The Law Offices of John Day, P.C. We Fight For The Rights of Those Who Have Been Injured By An Intoxicated Person. What is dram shop or liquor liability? The term dram shop is an old expression used to identify establishments that sold alcohol by the dram (a small amount). So, in simplest terms, it is the liability of those that sell alcoholic beverages by the glass. Under Tennessee law, liability may be imposed on bars, restaurants, clubs, theaters and other establishments that sell alcohol to individuals who are "obviously intoxicated" or underage. In addition, under certain limited circumstances, Tennessee law imposes liability on hosts of parties, weddings and other events where underage drinking is permitted. If you or a loved one has been injured by an intoxicated person, our experienced team of liquor liability attorneys will help you recover damages against all responsible parties regardless of whether the injury was by a car accident, a physical attack or some other way. We know how to get results. We have recovered more than $100 million dollars for our satisfied clients, and we would like to help you too. In dram shop and liquor liability cases, experience matters. At The Law Offices of John Day, P.C. we have more than 80 years of experience representing injury victims and, from the moment you hire us, we will thoroughly investigate and prosecute your case. We will analyze and photograph the accident scene, obtain the police report and other investigative materials compiled by law enforcement, interview witnesses, research the company's past violation history with The Tennessee Alcoholic Beverage Commission, request any video footage from the restaurant or bar, secure meal and drink ticket information, research the bartender's training and history and gather any other relevant materials. To demonstrate the nature and extent of your damages, we will gather all your medical and pharmacy records and, in appropriate cases, we will hire experts such as doctors, economists and life care planners. While you focus on recovering from the accident, we will take the hassle out of dealing with the responsible parties' insurance companies by handling all of the phone calls, paperwork and negotiations. And as always, if the insurance company refuses to fairly compensate you, we will aggressively fight for you in court to ensure you receive the money you deserve in the form of compensatory damages and, if appropriate, punitive damages. If you or someone you love has been injured in an accident caused by someone's intoxication, call us any time of day at 615-742-4880 or toll-free at 866.812.8787 or contact us online. We will thoroughly discuss your case and explain your rights during a free, no-obligation consultation. And, as always, if your injuries prevent you from coming to our office, we will gladly come to your home or the hospital. 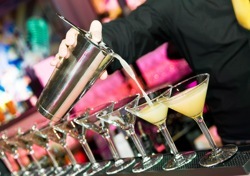 We handle all liquor liability cases on a contingency basis.